Launched in September 1993 in most markets, but not the United States of America, due to a patient problem. 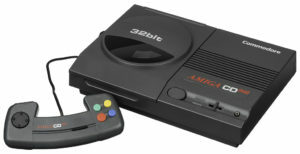 The CD32 was Commodores last consumer-oriented machine, and was primarily intended to be used as an games console based on the AGA chipset . It was basically an Amiga 1200, without most of the “computer” bits such as the keyboard, floppy disk drive, ports such as the serial and parallel ports. It used a new custom chip, the Akiko chip, which was said to enable chunky-to-planar graphics conversion in hardware, which was intended to make it easy for programmers to create games such as Doom. How useful this really was is still debated by members of the Amiga community, but the general consensus is that a faster CPU, such as a 25MHz 68030, as well as at least 1MB of fast RAM, would have been much more beneficial. However, this would most certainly have increased the price of the machine to a level too high for a games console. Software came on Compact Disks, just like the CDTV, and the machine came with a 6-button controller, which was generally considered to be awful. It was also designed to be reasonably compatible with software titles designed for the CDTV. Just like the CDTV, it could function as an Audio-CD player, as well as play CD+G and CD+MIDI CDs. It was promised that an add-on would be available for it to enable watching movies on it that were stored on Video CD (the White Book CD standard, but it could also play CD-i Video CDs), however very few of the Video CD expansion card required for this functionality were produced before Commodore went bankrupt. Various advertisements for the CD32 that were shown on TV and in movie theatres. The rare CD32 FMV VideoCD expansion card being installed and used. Workbench version: This machine did not come with Workbench, as it was intended as a games console.